You are here: Home / Jewelry / 19th century pearl and diamond tiara. 19th century pearl and diamond tiara. My dears, I am in love. No, this isn’t another post about my engagement ring, although everything’s still wonderful on that front. I’m in love with this late 19th century pearl and diamond tiara. Have you ever seen anything more fabulous? It’s just so exuberant. I pretty much hear angels sing when I look at it. It’s like a celebration you can wear on your head. This fantastic piece dates back to the late 19th century. It sparkles with circular and rose cut diamonds and the luster of natural saltwater pearls. 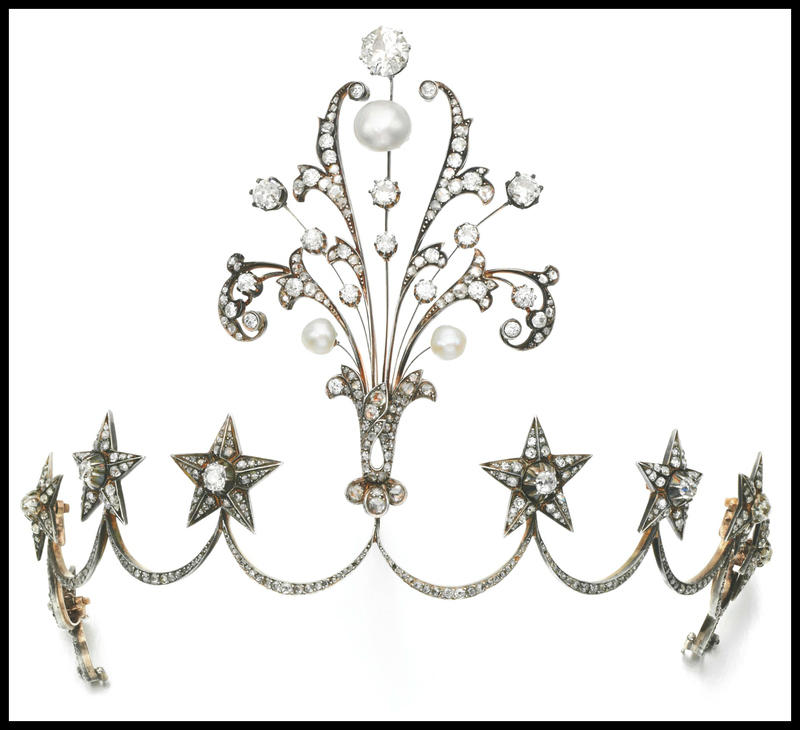 The base is an inverted scroll tiara surmounted with eight five pointed stars. 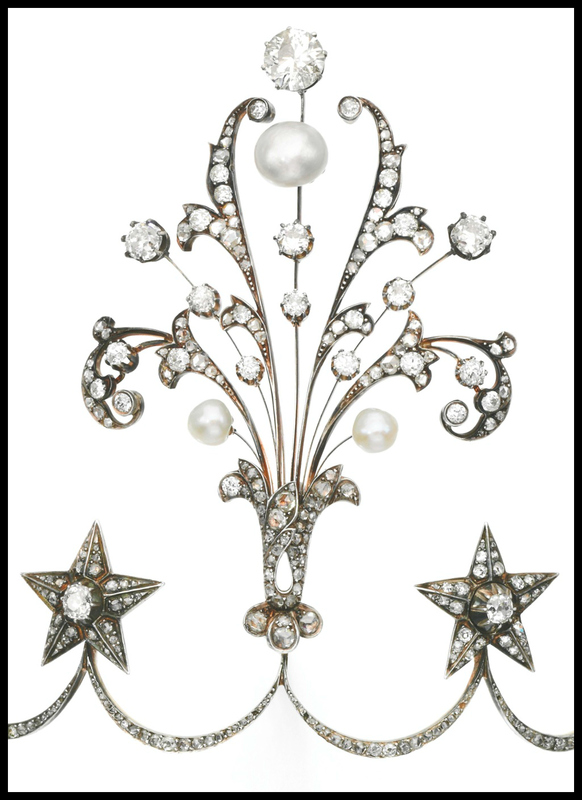 Here’s the center part, which is an amazing spray of diamonds and pearls properly called an “aigrette.” I don’t think I can describe it in any coherent way besides saying that I don’t think it could possibly be any more excellent than it is. It fills me with glee. 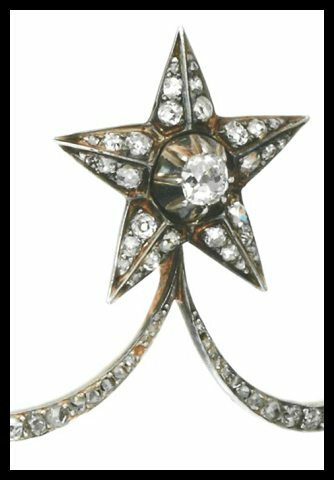 Each of the stars centers a larger diamond and is set with small diamonds. Do you love this as much as I do, or would you prefer a more sedate topper? This glorious 19th century pearl and diamond tiara was listed in a December 2013 Sotheby’s auction. All images and info are thanks to Sotheby’s.